Seashells is a completely self contained ground floor apartment, fully furnished to a high standard and comprises: your own private entrance and enclosed porch, leading to a dining area and kitchen. Fitted with: cooker, fridge, freezer, washer, dryer and dishwasher. A microwave and toaster are also provided. There is ample space to relax in our spacious lounge, which has a three seater sofa/sofa bed and a double sofa. For your convenience, there is a reasonably priced mini bar filled with holiday treats. Entertainment - 32” HD TV with HD freeview and DVD player, a selection of DVD’s are freely available from our movie library. Or perhaps you prefer to listen to your favourite music, using our digital radio/CD player. Keep up-to-date and in touch during your stay with complimentary Wi-Fi or why not hire our i-Pad for internet browsing. 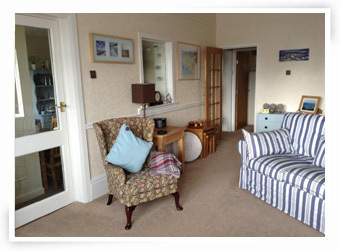 The bay window affords lovely views over the Conway Bay and Penmaenmawr, with West Shore beach less than a minutes walk away. 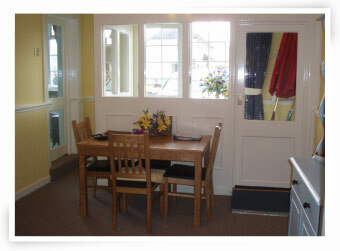 The two bedrooms lead off the lounge via a small hallway, the main bedroom has a double bed and hand basin. The second bedroom has twin beds, with a further two people able to sleep on the sofa bed in the lounge. Gas central heating is via the main house (no charge). There are also electric heaters throughout the apartment. Electricity is by a £2 coin meter. 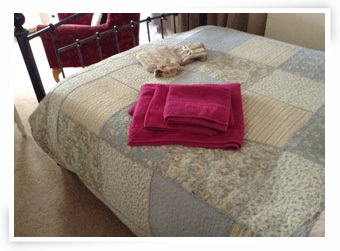 All bed, table, kitchen linen and personal towels are provided. There is ample off road parking on the gated drive. There is a patio to the front and rear for sitting and relaxing. A well behaved dog is welcome.